Ann Marie Meyers: The Allure of Fairytales!!! What is it about fairytales that continue to capture our imagination and the imaginations of our children? A more profound question is this. Why do so many writers feel compelled to reinvent the fairytale? Well, today I have with me, Bobbi A. Chukran, who has just written a very entertaining, lively and humorous book called, Princess Primrose and the Curse of the Big Sleep. The inspiration of this book (her twentieth!) has come from not one fairytale but several, which she has interweaved into one story. Moribunda McEvil (a wicked witch) is furious when she learns from Snitch, a tattletale fairy, that she has a beautiful niece, (Princess Primrose), whom she's never seen. With the help of her sidekick Eargore (a spell gone really, really wrong), she quickly sets out to ruin Primrose's life by putting a sleeping curse on her. In a fit of remorse, Snitch runs to the palace to warn Queen Floribunda and King Rosario about the curse, but in his hurry he misunderstands and gets everything wrong. The Queen hires S. White & R. Rapunzel, Inquiry Agents, to help. But by the time they get to the palace, it's too late--Princess Primrose has had an accident and fallen into a Big Sleep. With the assistance of their seven elven sidekicks (Nosy, Snoops, Sherlock, Stealthy, Creeper, Gumshoe and Marlowe), and a young witch who can only reverse spells (Miss Slumberkins), Snow White and Rapunzel Rapunzel search the kingdom for a Prince. What they end up with is a an enchanted frog who's afraid of germs (Prince Thaddeus A. Pole, AKA “Tad”), a motley assortment of enchanted creatures and Weasel the Wizard, who makes a bargain with the detectives for an essential potion that will save the day. Filled with twisted stories, fairy tale mash-ups, fun word play, misunderstandings and hilarious dialogue (and a happy, yet twisted ending), this story will delight anyone who still believes in magic. You'll never look at a frog the same way again. AMM: Bobbi, I’m going to start with a question I believe most children would love to ask you. What inspires you to write? BAC: A lot of the times I'm inspired to write because of a title that pops into my head, or I think about how cool it would be if I did a different version of some classic, always with a different ending. Many of my short stories and plays start this way. Some are based on real-life situations (like a neighbor cutting down a perfectly healthy tree), or are inspired by a theme, such as a holiday story, but most just come in as snippets here and there. I always see a story played out in my mind like a movie--I guess that's why I can write both plays and books. AMM: What a gift to be able to visualize your stories in movie form! So what made you decide you would like to write for kids? BAC: I didn't make a conscious decision to write for kids in the beginning. Although my mystery novel, Lone Star Death, was for adults, I had written three non-fiction early readers as a work-for-hire project and thought I'd like to eventually write more for kids. My first play, Annierella & the (Very Awesome) Good Queen Fairy Cowmother, was written as an adult play. I always saw it as a sort of PG-rated Monty Python skit. But of course, when you write anything that's based on a fairy story (in this case, a very loose Texas-style adaptation of Cinderella but with a totally different ending), people assume it's a kid's story. A director read about the play on a Yahoo group and asked if I'd submit it for a youth theatre festival he does in North Dakota during the summer. Of course I said YES! The play won several awards, and since then, I've written a long string of similar plays that have been done by kids. Annierella was eventually published by Brooklyn Publishers and has been produced across the country and the sequel (Annierella and the (Not So) Secret Garden) is premiering in North Dakota this week! The same group also did Little Red Riding Boots & Cooter Coyote, Master of Disguise last year, and it also won awards. Princess Primrose won an award from a children's theatre in Arizona, so I decided to turn it into a novel. People don't usually read a lot of plays, and I wanted to get the story out there. AMM: Very impressive, and huge kudos to you, Bobbi. I’ve noticed you have something else working in your favor: humor, which is a talent unto itself. Does that come naturally to you? BAC: The humor that creeps into my stories comes mostly from the characters, and the antics they get up to in my head. Once I have the bare bones of the plot, and the characters, they really do start acting out and sometimes it's like taking dictation. I've been told that I'm funny in real life, so I guess it just tends to seep into the story. I don't consciously try to be funny. I do like reading humorous books, and love watching funny plays, classic cartoons, British comedies and movies, and I think that helps. Although the characters in Princess Primrose took off on their own, I did catch myself thinking what would be really crazy to do in this particular scene? What would a jester do in this case? So then I turned it around, and made him sad. People aren't expecting that. AMM: And you also illustrate your books. How does that work? Do you first see the vision of what you want, draw it and then write? OR do you first write the story and then draw the illustrations? BAC: Princess Primrose and the Curse of the Big Sleep is the only kid's book that I've illustrated. I have done photos for other non-fiction books, but not these types of drawings. I do have an art degree, and over the years have been in an inner struggle: art or writing? I've pretty much been able to do both, but thought it would be cool to combine them in a book. Since I'd already written the play this book is based on, I sort of had an idea what the characters looked like in my head. However, I also doodle strange characters, and after I draw them, like to put them into stories. So other books might spring out of those drawings. AMM: You’re lucky. I wish I could draw. It must be so rewarding to go beyond words and ‘concretize’ the image of a character, or place. What age group have you written Princess Primrose and the Curse of the Big Sleep for? And how did you come up with this take on such a timeless story. BAC: Realistically, I expect that kids in middle grades will like it, and appreciate the characters and humor. The play was written for all ages to perform, from 8 on up through adult. In the case of Princess Primrose and the Curse of The Big Sleep, I wanted to combine a handful of different fairy tales into one story. Since I also write and love to read mystery stories, I wanted to do a spoof on noir detective stories, so I wondered, who would be good for the main detective characters? I always write about strong female characters, so Snow White and Rapunzel popped into my head. With Snow White, of course, came the seven little dwarves, except I made them elves. So then I asked, what other kinds of characters would populate a story of this type? I added a princess, an enchanted frog, a queen and king, a court jester, a wicked witch and a wizard. I have SO much fun naming the characters. So by the time the story was plotted out, I had mixed the stories of Sleeping Beauty, the Frog Prince, Snow White, Rapunzel, etc. except in a crazy, mixed-up way. All of my comedies, plays and stories, seem to develop along these lines. AMM: That is so cool!!! I have one final question. What’s next for you? BAC: What's next? Good question! LOL. I just published a short comedy caper holiday story, and since I write PG-rated stuff, it's suitable for all ages. I have a whole backlog of plays, short stories and book ideas that I want to get out there, so am slowly working my way through the pile. Working on both kid's books and plays, and adult-level stories keeps me from getting bored. 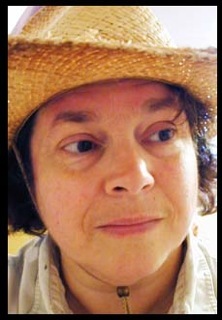 Bobbi A. Chukran is a native Texan who now lives in Taylor, a small town outside Austin. Bobbi earned an art degree from the University of Texas in ‘81, majoring in studio art/design. Bobbi has always loved writing stories, and her first book was published in 1984. Over the years, Bobbi has combined writing and art careers, but didn’t start writing for kids until 2000 when three of her non-fiction early readers were published by The Wright Group. Never content to get bored or to choose Just One Thing, since then Bobbi has also written mystery fiction, poetry, short stories, and award-winning plays for young people. Plays are her favorite thing to write. Four of Bobbi’s plays have won awards in national competitions. Many of Bobbi’s books and stories start out as plays. 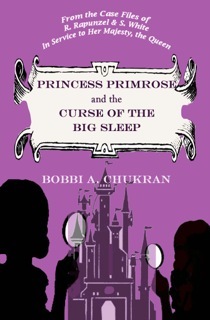 Princess Primrose and the Curse of the Big Sleep is Bobbi’s twentieth published book. Great interview! Thanks Ann Marie and Bobbi! It was my pleasure, Brianna! 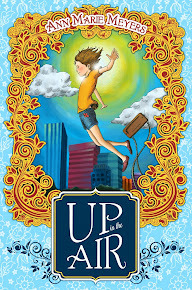 'Up In The Air' ARC Giveaway - 2nd Run!!! Design Amie Borst http://amie-borst.com and Susan Ward http://boostbusiness.ca Bkgrd Image D.Bryant. Simple theme. Powered by Blogger.